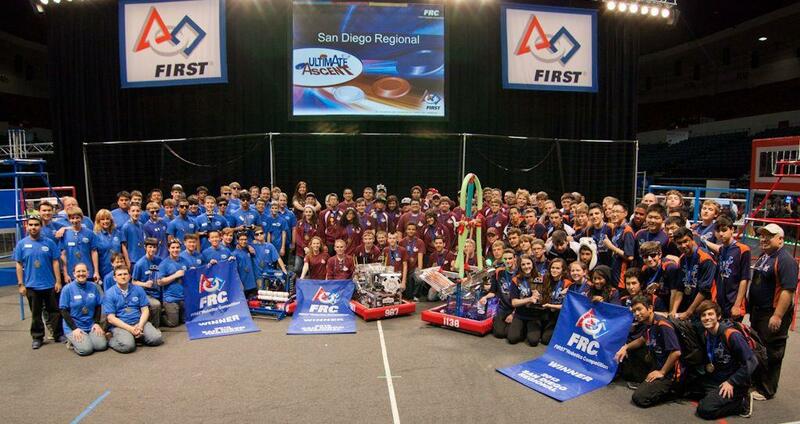 2013 San Diego Regional Winners! After a difficult six-weeks of design and construction, Team 254 wins the San Diego Regional with Alliance Captain Team 987 and Alliance Partner Team 1138. This past Wednesday, thirty students rode a bus down to San Diego to compete in the annual San Diego Regional (March 7th – March 9th). The team unloaded the bus on Wednesday night and went to the hotel after dinner. 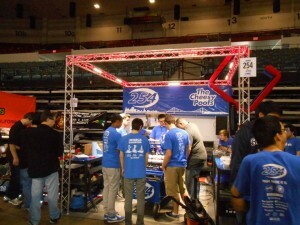 We also set up the pit and implemented many changes to the robot from our work on the practice bot. We further implemented many changes to the robot. For example, we added the new shooter with the new speed reductions and mini-CIM motors, changed the pulleys on the conveyor to increase the speed, added the level one hangers, and changed the intake to reduce jamming. The robot spent a lot of time on the practice field to ensure that all the bugs were ironed out. Unfortunately, there were still many more issues that needed to be fixed. 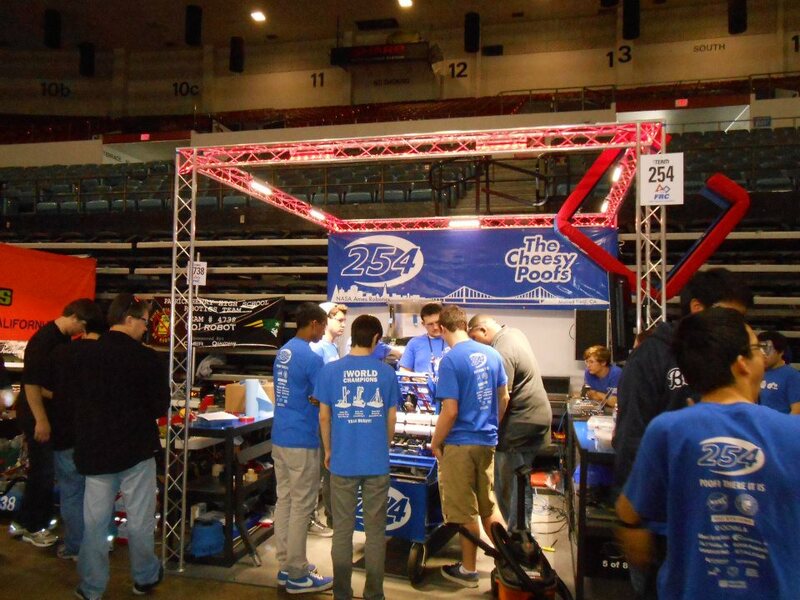 On Friday, we had a rough start with qualification matches. After many struggles with shooter inconsistencies, sensor malfunctions, and autonomous bugs, we ended the day with a fantastic match. The last match on Friday demonstrated to the competition what we were capable of. Our alliance scored a tournament high score (at the time) of 153 points. The video will be posted soon. Saturday’s matches went well. During lunchtime, we were aproached by Team 987 (The High Rollers) from Las Vegas, as they wanted to ensure maximum compatibility on the field between the two robots to guarantee a tournament win. Thus, we demonstrated our multiple autonomous modes to them on the practice field.  At the alliance selections, Team 987 picked us, Team 254, as a second pick. Our third pick was team 1138, Eagle Engineering from Chaminade College Preparatory. 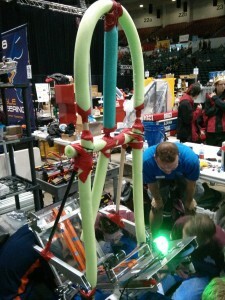 After intense quarterfinal and semifinal matches, the joint pit crew from 987 and 254 added an effective blocker made of pool noodles to 1138’s robot (also known as pope-bot), pictured below. This was to defend against a full court shooter which could have been a deadly scorer during the finals if 1138 hadn’t defended so well. In a nail-biting final match, the 987-254-1138 alliance won, earning the title of 2013 San Diego Regional Champions. After the final matches, we were awarded the Quality Award sponsored by Motorola and the Tournament Winners at the award ceremony. We would like to congratulate Team 1538: The Holy Cows on a well-deserved Regional Chairman’s win, and Rodger Dohm from Team 1622 on a Regional Woodie Flowers award. Overall, the 2013 San Diego Regional was a well-run and successful tournament. The next step is preparing for the Silicon Valley Regional in April, which is arguably the most competitive regional of the year. There are a few identified changes that need to happen to the robot which include shooting and indexing faster, adding our 30-point hanger, and tuning autonomous modes.